Or 6 weekly interest-free payments from $4.16NZD What's this? Gentle Self-Tanning Face Cream is a moisturising self-tanner designed specifically to use on your face. It gives a subtle tanned glow, is non-greasy and doesn’t have that overpowering 'fake tan' smell. It is suitable for all skin types including sensitive skin. We have used a combination of active tanning ingredients including those naturally derived from ripe raspberries to give an even, smooth looking tan. Whilst awesome natural ingredients like meadow foam oil (from a beautiful annual flower) have superb anti-oxidant properties as well as being highly moisturising. And strawberry extract has unique vitamin structures that help to restore suppleness and moisture to skin. In short, Gentle Self-Tanning Face Cream is going to leave your skin feeling and looking fantastic. Apply Gentle Self-Tanning Face Cream to clean, dry skin. The key is to make sure you don’t miss any obvious spots and that you blend it gently around areas such as your hairline. Also be careful around eyes and eyebrows. A good trick is to use a cotton bud to wipe off eyebrows after application so you don’t have any residue left on them. This product is suitable for vegans! Free of parabens, mineral oil, phthalates, sulphates and nano-particles. This product does not contain sunscreen and does not protect against sunburn. For that purpose, choose Oasis Sun to keep you protected. No bad smell and I can use it in exchange with my moisturiser on occasion to have a little bit of a healthy look without skin damage. Really easy to apply, dries quickly and develops great colour especially when used a couple of times. 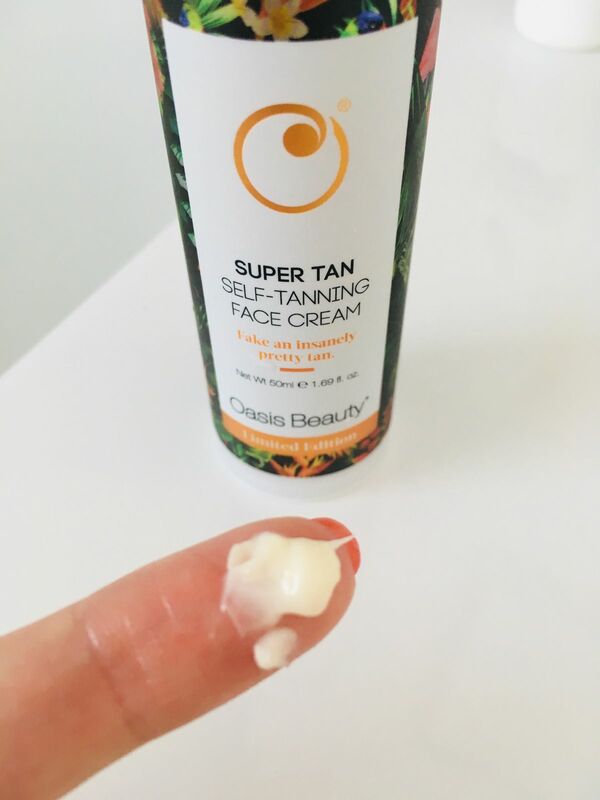 I was a little hesitant to use this Limited Edition face tanning cream on my pale, fair skin, but it is a very gentle, subtle tan that is able to be built up gradually over a few days until the correct depth of colour is reached. I have uneven skin tone on my face due to pigmentation spots, and I found that this tanning cream helped to even out my skin tone a little and make the darker spots a little less noticeable. It's also great to use when I'm on holiday, as it eliminates the need to apply foundation every day. Should have tried this sooner! I have very pale skin and have not tried a facial tanner before, so I was a little apprehensive. I didn't need to be, it works great. It feels like a nice facial moisturiser when you put it on. There is no patchiness or orange hue. I just look like I have healthy, glowing skin.